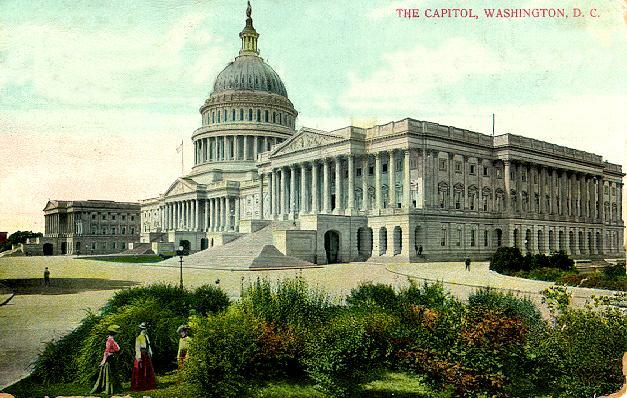 Since next year brings a new interest in Washington D.C. and the inner workings of the American government, I thought it best to deviate from my emphasis on Edwardian Britain and swing the focus to Washington D.C. of the 1880s to 1910s. Regardless of personal views on the outgoing President, or the President-Elect, not only do I believe that no one can possibly be immune to the excitement and emotional charge of witnessing yet another process of America’s democracy. Stay tuned for posts about the White House, our past Presidents, famous Congressmen, social and etiquette proceedings, D.C. society, and so on! Check out Scandalous Women for witty and erudite musings on those women, famous and infamous, who have characterized the history of Washington D.C.